In a large nonstick skillet over medium-high heat, heat olive oil; cook chicken until fully cooked and juices are clear. Remove chicken from pan, allow to rest 5 minutes before slicing. In small bowl, whisk together honey, garlic sauce, vinegar, soy sauce, peanut butter, and water. 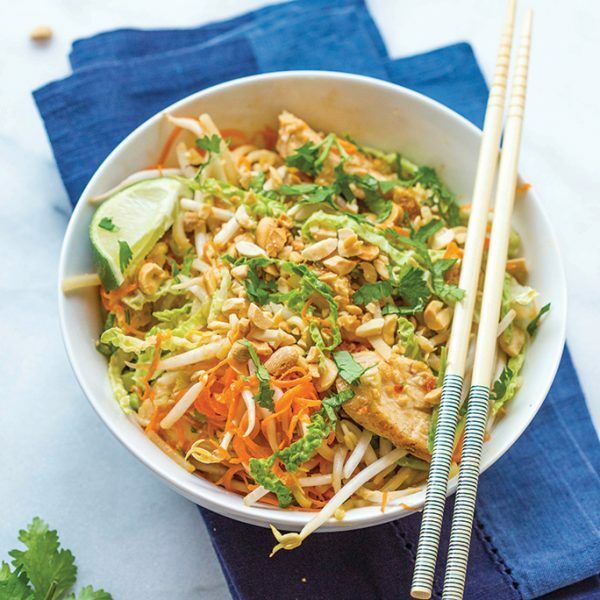 Add zucchini, carrots, noodles, and chicken to pan; pour sauce over and toss to coat, toss in bean sprouts and cabbage. Serve with lime wedge, crushed peanuts, and cilantro.